Anne Wills. An Adelaide TV Legend. The name Anne Wills is synonymous with Adelaide television. She began her career on ‘the box’ in 1965, just a few years after television started in Adelaide and has been either on our TV screens or some other media entertaining us for more than 40 years. Legend has it that it’s a career that might never have started. She was first spotted by Channel 9 programme manager Rex Heading performing during the 1964 Telethon Quest and a few days later he called her out of the blue inviting her to come into the studios to audition as the weather girl. Anne assumed it was a prank call and didn’t bother going in. “So I was sitting at home after work the next day and the phone rang and it was this person claiming to be Rex Heading again,” Anne recalls”. I still didn’t believe it and I asked him to give me the number for the station and told him I would ring him back, just to make sure it was legitimate, and I rang back and there he was. I realised that it was Rex, that he was for real”. Anne reflected on her 47 rears on Adelaide TV in an article published by the Advertiser in 2012. “The audition was terrible. I had a cold sore at the time, I was trying to cover it up. I was so self-conscious. I had trouble with some of the words. “There were no autocues or anything like that but I did it and went back to Para Hills where we were living at the time and thought that nothing would come of it.” But, the next day, she was told she had the job. Even then, Anne didn’t think she would be working in television forever. She gave herself six months in TV, after which she intended to return to her childhood home, a dot in the Pacific called Ocean Island, part of the Kiribati group of islands not far from Nauru. Photo from Channel 9. Anne really got the town talking one hot night when she did the weather in her bikini. “When I started as weather girl they gave me no parameters or instructions for the job, other than telling me not to swear. They just told me to be myself. The luckiest part was that the newsreader was Kevin Crease, God rest his soul, who was just the world’s loveliest man. He would say ‘Now here’s Anne’ and he would have this smirk on his face and then I would throw back to him and there was always a bit of funny banter there. 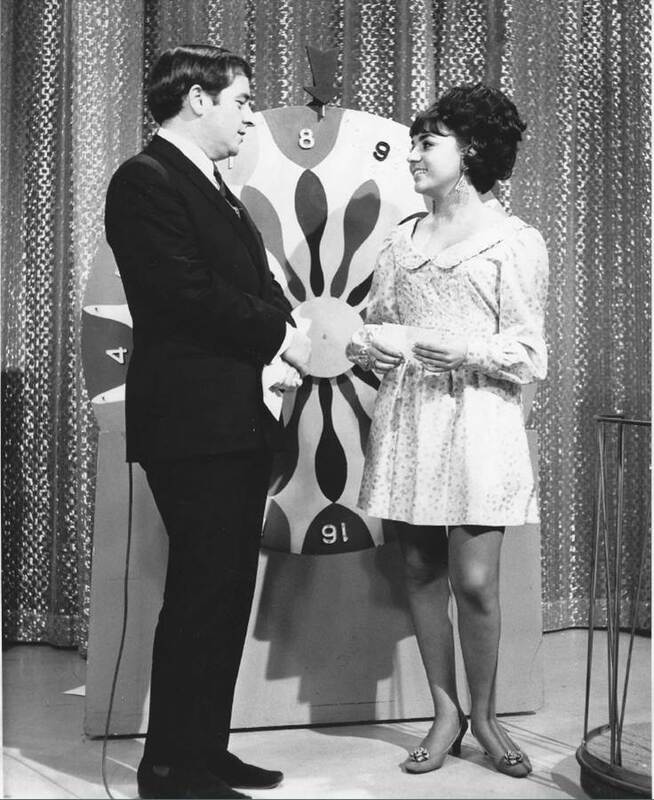 Anne soon caught the eye of Ernie Sigley who was hosting Wheel of Fortune and had been trying out different girls as co-hosts. He asked her to come on the show. With 19 Logies sitting on the shelf Anne finds she still can’t get from one end of the street to the other without being stopped for a chat, and even gets pulled up by fans if she dares to leave the house without her trademark oversized earrings. Remember the Queen’s First Visit to Adelaide? 2 Responses to Anne Wills. An Adelaide TV Legend. Anne – now in my 80’s I still remember your vivacious TV appearances and still today you cheer me up when I see photos or clips of you – I belong to the Combined Probus Club of Burnside and I know that many of my fellow members feel as I do and it is that that prompts me to ask whether or not you would be prepared to speak to our club next year sometime. If so perhaps you would email me for details of times etc. A short message to my friend anne wills hi anne remember john and kay we took you and Michael sailing on our yacht from the rsays outer hbr. all those years ago when we were young and beautiful. Michael and I were great mates in the I still remember him and of course the shock when I heard about his plane crash I was devastated. we were both in the insurance business at the time I remember the night before he met you we were at the hotel In Melbourne st Adelaide he was tossed out for being over intoxicated but he went back next night to meet you and that was love for you and him .gotta say I am 80 now but he will always be my mate and you too . I live in woy woy bay now and if there is a way you can say hullo I would treasure it dearly .all the best to you. ph 0478 658 108.